~ Monsters University has Problem Solving. Ages 4-7 years. Great for any Gift Giving Occasion. 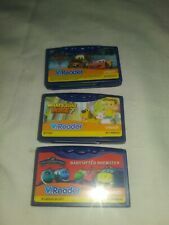 Vtech Vreader Game Cartridges Cars Disney Chuggington What's That Noise. Condition is Used. Shipped with USPS First Class Package. Shrek Forever After. Disney Fairies: Explore Your Talents. Disney Princess. Jake and the Never Land Pirates. Penguins: Mission Madness. Toy Story 3. You are purchasing a NEW VTECH INNOTAB STARTER PACK WHICH INCLUDES 3 GAMES (TURBO, MONSTERS UNIVERSITY, AND HELLO KITTY) AND A INNOTAB STORAGE TOTE TO KEEP YOUR SYSTEM SAFE. ALL ITEMS ARE BRAND NEW AND NEVER USED!!! THIS KIT DOES NOT INCLUDE THE VTECH INNOTAB SYSTEM ITSELF. ITEM SHIPS USPS WITHIN 1 BUSINESS DAY. THANK YOU FOR YOUR BUSINESS. New Vtech Hello Kitty's Surprise! Ages 3 to 5. V.Reader E-Reading System not included. YOU ARE GETTING EXACTLY WHAT IS PICTURED..
NEW Lot of 2 VTech V.Reader Animated Disney Games ages 3-5 Gift Idea! Disney Pixar Toy Story 3 : Andy is all grown up! He's leaving for college soon. What will happen to all of his toys?. They're excited to play with kids again, but all is not as it seems. Soon the toys realize that they have to escape! ONLY LOWER 48 STATES. as seen in pic. Virgin Islands, Bahamas or. Vtech Mobigo Game Hello Kitty-Birthday Party! Compatible with all VTech MobiGo systems. Features a wide variety of Sanrio characters including Hello Kitty and many of her friends. Customize Hello Kitty's appearance by unlocking new outfits in her wardrobe. Kids can also learn about music and make a Hello Kitty greeting card. It also includes an eBook that kids can read to themselves or with parents. VTech InnoTab Software, Hello Kitty Children can also make a Hello Kitty greeting card or import their own photos into a digital Hello Kitty photo album. Read the original story "Hello Kitty's Surprise". E-book for kids features a fun cast of characters including Hello Kitty and many of her friends. Works with InnoTab® systems except InnoTab® MAX. VTech - InnoTab. HELLO KITTY and FRIENDS. Original in BOX. Asia & Oceania : Australia, Hong Kong, Japan, New Zealand, Singapore, South Korea, and Taiwan. Syllables, Plural/Singular, Letter Sounds, Character Traits and more. Hello Kitty. V.Reader by V Tech. Brand new in the box 2 Mobigo Hello Kitty birthday party 5 learning games. For ages 3-5 years old. 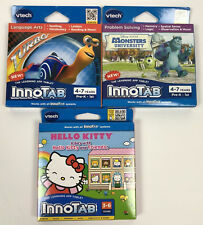 (NIB) NINE Vtech InnoTab - Three Each TURBO, HELLO KITTY & MONSTERS UNIVERSITY. (NIB) NINE Vtech InnoTab - Three Each TURBO, HELLO KITTY & MONSTERS UNIVERSITY. Condition is New. SATISFACTION GUARANTEED. Free Shipping. V.Reader Vtech Hello Kitty Interactive E-Reading System Hello Kitty's Surprise! Hello Kitty was planning an exciting surprise party for her twin sister Mimmy and invited all their friends. Little did Hello Kitty know that there would be a wonderful surprise for her too! Read, listen and interact with the story to build reading skills and learn new words. The proceeds then go into our girls' college funds. The answer doesn't always have to be "Yes" -- I'm not that crazy of a dad -- but it needs to be "Yes" more often than it is "No.". The answer doesn't always have to be "Yes" -- I'm not that crazy of a dad -- but it needs to be "Yes" more often than it is "No.". Game/Catridge for the VTech VReader. Hello Kitty Kitty's Suprise brand new in the package. Vtech InnoTab Hello Kitty "A Day with Hello Kitty Friends" ages 3 to 6 years. E-book, Music, Memory, Math, Crativity & More. NIB, never opened! Disney Princesses (Belle & Cinderella) - Teaches - Letters, alphabetical order, beginning sounds, syllables and more. Hello Kitty - Hello Kitty's Surprise - Teaches: Syllables, plural/singular letter sounds, character traits and more. Mobigo & Mobigo2. Compatible with all VTech MobiGo systems. Hello Kitty. including Hello Kitty and many of her friends. Customize Hello Kitty's appearance by unlocking. The VTech Hello Kitty Software for MobiGo is an interactive touch learning system for kids from 3 to 5 years old. This VTech Software teaches counting, simple addition, logic, letters, vocabulary and more. Hello Kitty was planning on an exciting surprise party for her twin sister Mimmy and invited all their friends. Little did Hello Kitty know that there would be a wonderful surprise for her too! Read, listen and interact with the story to build reading skills and learn new words. This is in like new condition. 3-5 years. Made in China. We'll do what we can to fix the problem as fast as we can.